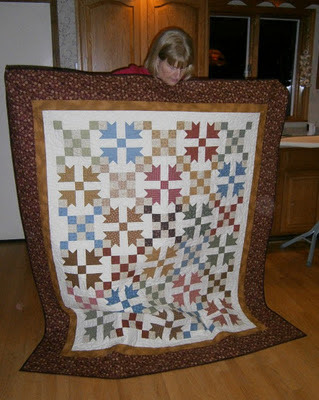 Voting Quilters of America: In an effort to gain more votes than in prior elections, I am going to ramp up my campaign. When I am President, the BASE of the food pyramid will be CHOCOLATE!!!! And the dairy portion will be chocolate ice cream! And not the fat-free stuff, either. Your right to bear needles, scissors and thread through airport security will be assured. All quilters will be issued special badges that allow them to sail through security. Everyone knows (or should) that quilters cannot pack light. No extra baggage charges will be allowed for extra suitcases above the allowable limit if they are packed with quilting supplies. No one will be allowed to say "Wouldn't it be nice if you finished something?" As your presidential candidate, and in the spirit of full disclosure, I can honestly say that I have over 120 UFOs. I doubt that many of you can top that number, so be sure to print this post to show to the "Finishing Police". As your soon-to-be-elected President, I will pardon all quilters with vast numbers of UFOs. There will be no more guilt, no more shame, no head-hanging in public (or in private). With those words to mull over until next time, I remain your best hope for a brighter tomorrow. Shortly after finishing the gray sweater, I bought some luscious Candy Cane yarn and started another one. Okay, I actually started it twice. The first time I found an error not long after joining in the round, so I ripped it back and started again. 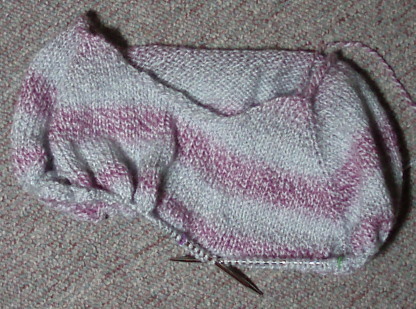 Knitting when I had nothing better to do, I was almost three-quarters of the way to separating for the sleeves when I found--an error! You can see it here, the rows just are not consistent. And it's on the front where I would see it every time I looked down. 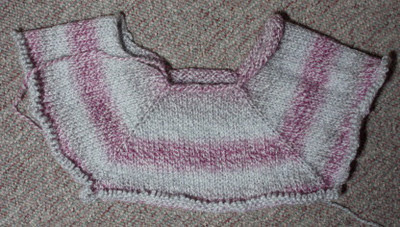 Here's what I had done, still on the needles. 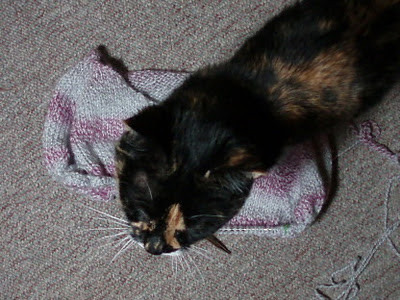 Callie came to investigate--did I say the yarn is soft and cushy? Here it is off the needles. Love the striping. 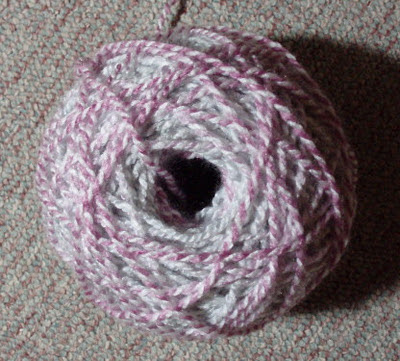 And here's that mess of yarn all neat and tidy in a center pull ball that I wound myself using a paper towel roll. Low tech and not wound too tightly. Never fear, while contemplating the fate of this sweater, I cast on and have knit several inches on a pullover vest in a fabulous deep plum. 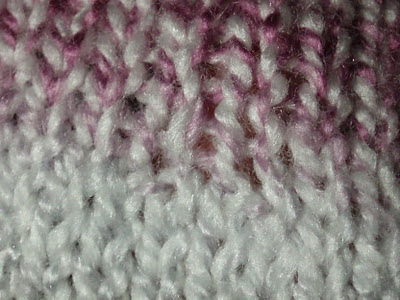 Knit bottom up, there are no pesky increases. Just 16.5 inches of stockinette. I hope I can keep myself and my knitting in order at least that much! And I'm sure the third time will be the charm for the other sweater--it's not over yet! I have fiddled and fiddled with the pictures for this post, but have decided to just tease you with one and to tell the rest of the story tomorrow, when I can get the pictures under control. P.S. I am listening to Devil's Gate by Clive Cussler. 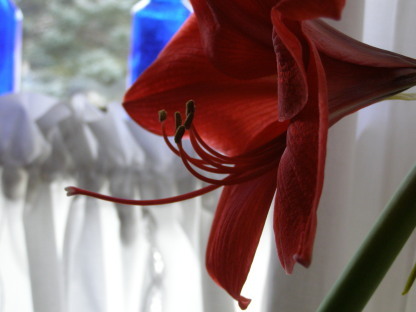 The amaryllis is just too beautiful to not show once more--I couldn't help myself! 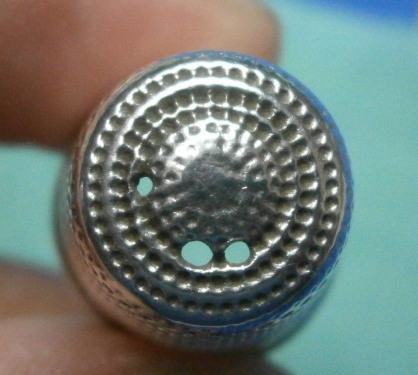 Close-ups provide much more detail than is really available to the naked eye. 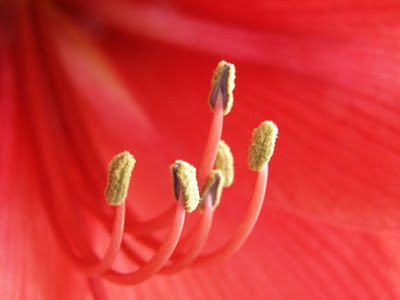 Grains of pollen. And four blossoms! 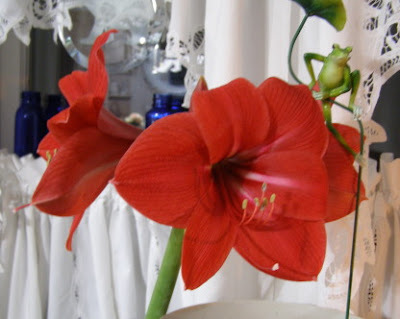 Three are out (one is behind the frog) and a fourth bud is open today (Saturday). The pictures were taken Thursday. A little something to hopefully brighten your day. 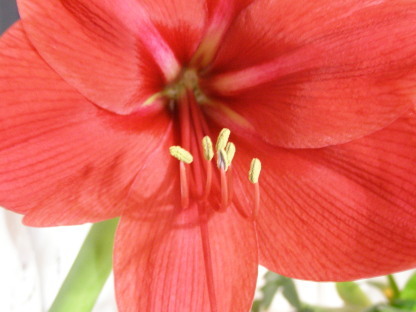 Consider getting an amaryllis bulb around Christmas this year--they are just amazing to watch. 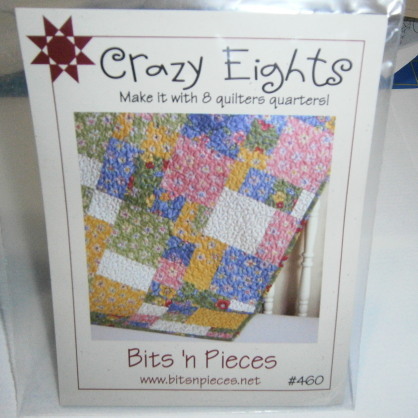 Here is the Crazy Eights top set together. Once you can stop yourself from rearranging the blocks, it sets together fast. 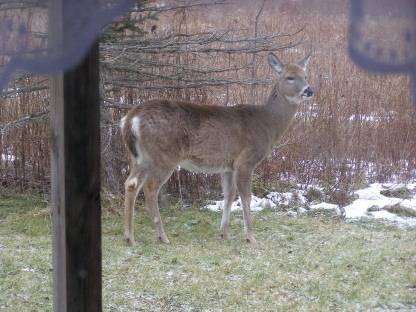 And my visitor was back today. 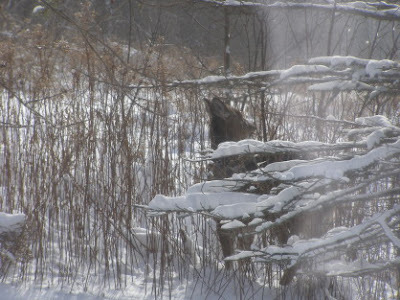 She (I'm thinking she's a she) grazed around the bottom of the spruce tree for quite a while. Then Lynnie saw her from the door and started barking. 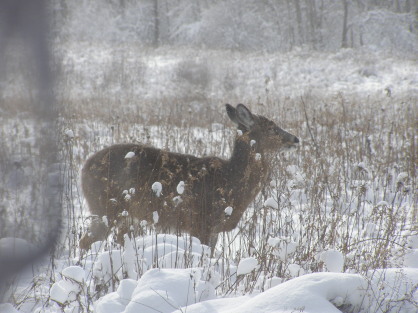 The deer here are so used to us that she looked up and then slowly meandered away. I'm going to go hand quilt for a while. I'm really excited at how this piece is turning out. P.S. 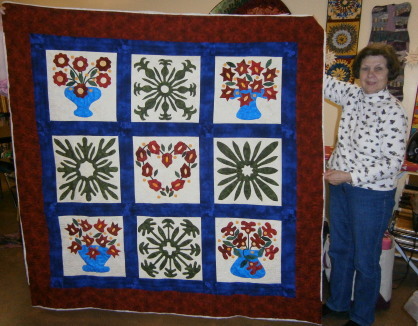 Check out The Quilting Professor blog (link on side bar) about her charity quilts. It's truly an AWWW moment today. This morning, when I looked out at my car, I couldn't imagine what was going on! There was fluttering and much to-do near the passenger side mirror. 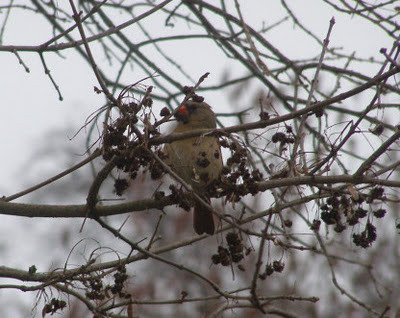 I finally figured out that there was a female cardinal trying to "take out" the bird she saw in the mirror! Herself! She fluttered in the mirror, flew to the top of the mirror and then repeated the process five or six times! A bit later, as I was sitting at the computer in the sewing room, she tried the same trick against the window! When she finally calmed down enough to sit, I snapped her picture. 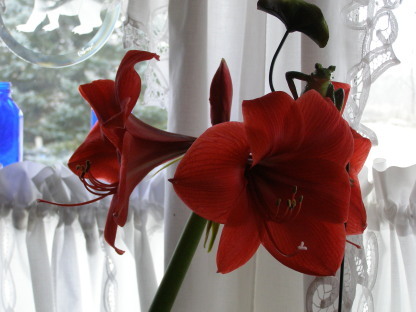 The amaryllis has three of four blooms out! The box said the blooms would be pink and white striped. Oops! Still striking! I've had to prop the stem against another planter to keep it upright. No matter how much I turned the stem away from the light, it stayed in one crook. 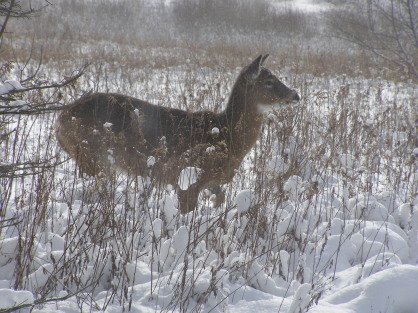 You can practically see the plants growing by leaps and bounds, which is fun during the winter. My mom has had two batches of snowdrops blooming outside already. I am quilting away on a project that was over half done about five years ago. And I've rearranged my Crazy Eights about nine billion times! I may set it tomorrow just so I will stop playing with it. For Christmas a friend gave me the Crazy Eights pattern and the fabric bundle! It's been fun working with fabrics that I didn't have to agonize over! Here's the pattern cover, in case you get the urge to try this yourself. There are also shops that bundle the fat quarters for you. One is Quilters Corner in Ithaca, NY (www.e-quilterscorner.com). I know none of you have 8 fat quarters in your stash! Here are my four sets of blocks. And this is the layout after much re-arranging and fretting. I am still looking at it and won't set it for a few more days. (Looking at the picture as I am typing, I found one area I didn't like and I've already rearranged it.) I don't think there is a wrong way to put this together--mostly trying to get the fabrics separated. I'll post the final picture--when I get there! I'm finding it more and more valuable to take digital photos of quilts on the design wall. First, it means that each time I rearrange blocks I can go back to a prior iteration without any difficulty. Second, as in the photo above, many things that you keep staring at aren't apparent until you look at a picture. The good news? You don't have to print any of the pictures! You can look at them on the camera or download them to your computer to view them larger. That's it for now. I'm listening to The Next Always by Nora Roberts and reading The Rope by Nevada Barr. I must say that I am so thrilled that students are finishing their class projects! It's so exciting to see the tops come alive. 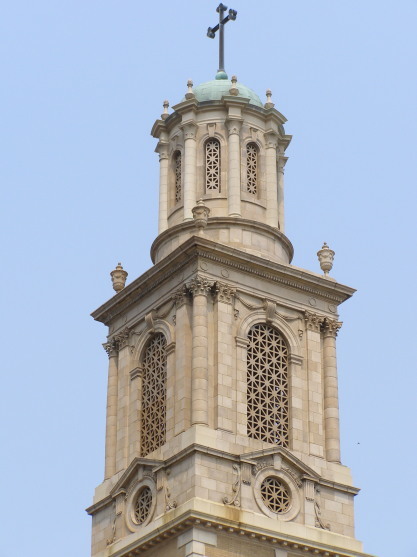 You saw part of Judy D's In Baltimore Style top in a prior post. 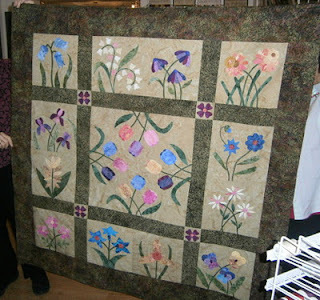 She had it machine quilted by Sandy Branch in North Carolina and just needs to bind it! Here's a detail shot of some of the quilting. On the cutwork blocks she did echo quilting. 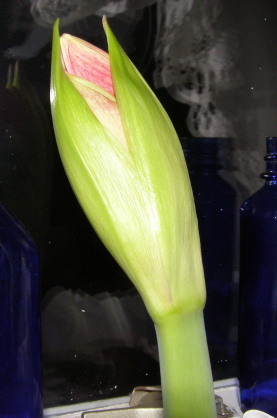 The red border is filled with undulating feathers. Congratulations to both Judy and Sandy! 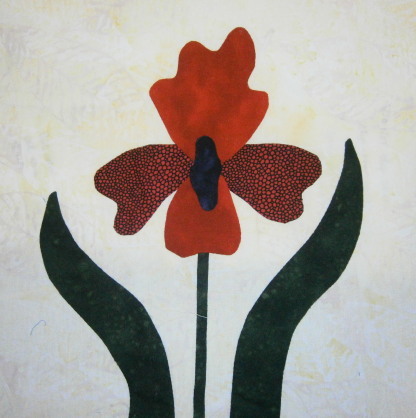 Kathy F., a member of the Green Thumb class, made this stunning Iris block last month. Kathy learned to applique about a year and a half ago. It's impressive what she's accomplished in that time! I'll be sharing more student blocks from the Green Thumb class in upcoming posts. The flower fabrics and backgrounds are varied and beautiful! 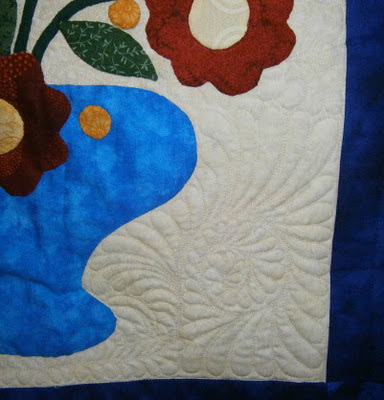 I've heard several comments over the years that a hand pieced or hand appliqued quilt should ONLY be hand quilted. 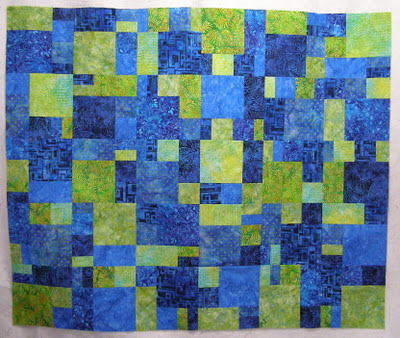 Being a dyed-in-the-cotton hand quilting lover, of course, I would love to see every quilt done by hand. BUT...I am a realist and I also mix techniques myself. I learned to machine piece long before I did any hand piecing or applique. 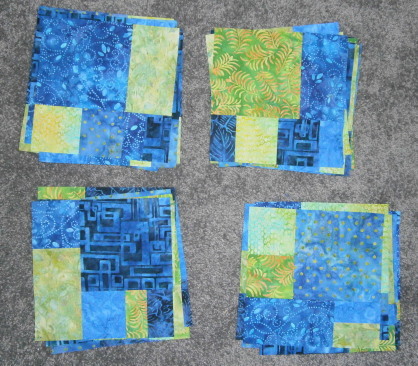 But I did teach myself to hand quilt right at the beginning because I loved it so much. Someone a few weeks ago, in one of my hand piecing classes, asked if the top had to be set by hand because the blocks were hand pieced. My answer: Absolutely not! (I thought the student was going to faint with relief!) I purposely choose blocks for hand piecing that I would not want to sew by machine--with as many set-ins, tiny pieces, Y-seams, etc., as possible! 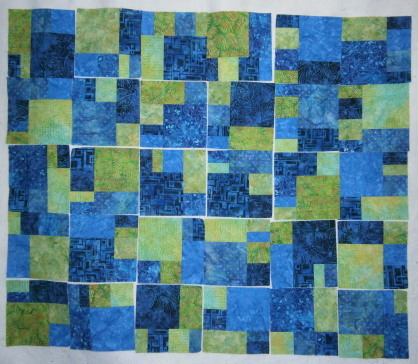 But I can more quickly and as accurately set those blocks with sashing, cornerstones and borders by machine. Can people do it all by hand? Yes. Do I do everything by hand--rarely. And let's be serious--with over 120 unfinished projects (over 65 basted for quilting), something has to give. Another option? Machine quilt down long lines and around blocks to stabilize the quilt (after proper basting, of course)--you know, the in-the-ditch stuff that won't show. Then hand quilt details! A great resource for this? A Modern Mix by Anita Shackelford (www.anitashackelford.com). And check out the chile pepper quilt on the back cover (and it's inside too! ); that's mine! I pieced the top and Anita machine quilted it with a chile pepper design in chile pepper colors! I still remember the first time I told a class that I had sent out a quilt for machine quilting. A simple machine pieced checkerboard design that would be used hard. I struggled with myself over the decision but decided machine quilting would be best in that case. One of the students looked me right in the eye and said "That's unacceptable from you." At first I was taken aback. Then I put in perspective. At that time (many years ago), I had probably hand quilted over 300 pieces from small to large. So machine quilting one was certainly not going to throw my percentages off by even 1 percentage point. I could live with that. Of the over 500 finished quilts I've done to date, less than 20 are machine quilted. I do admire the look of fine machine quilting. It's an art form in its own right. Bottom line: Do what makes you happy. There is no wrong answer if you are happy with your choice. Finished and usable--isn't that the real goal? 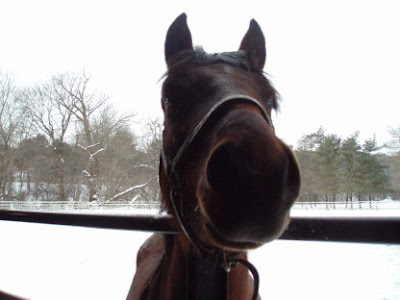 Geez, I was thinking this would be a short post--you probably needed that second cup of coffee to get through this! Just food for thought. Comments, anyone? Just a couple quick things tonight. 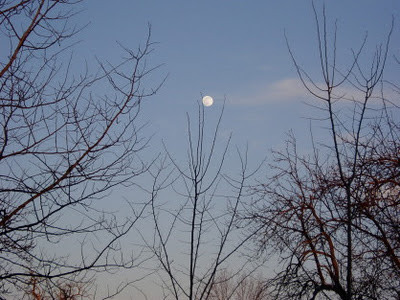 First, I've updated the Schedule page on my website: www.sharonstroud.com. Classes are listed, by shop, from now to the middle of April. I hope to see you at one or more, if you live close enough! Second, for those of you who have been at the Wiawaka retreats, sad news. Menga has passed away. Truly the end of an era. Did any of you watch Alcatraz Monday night on Fox? 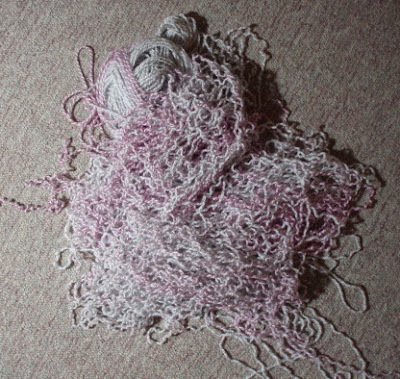 I was on the edge of my seat--no knitting or quilting during that program! That's it for tonight. Have to prep for class tomorrow. We don't have much snow, but it is bitter cold and then add the wind chill. Icy underneath from the rain we had first! I guess the weather people call that a "wintry mix". Yes, its the amaryllis again! The one stalk has taken over. 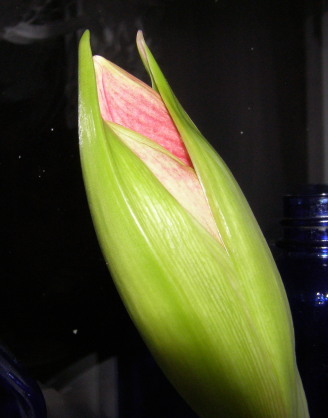 The three or four leaves are only a couple inches tall and the other bud is going to fall off (I can't bear to cut it off--there might be some miracle and it will survive). Just today the tip split open. 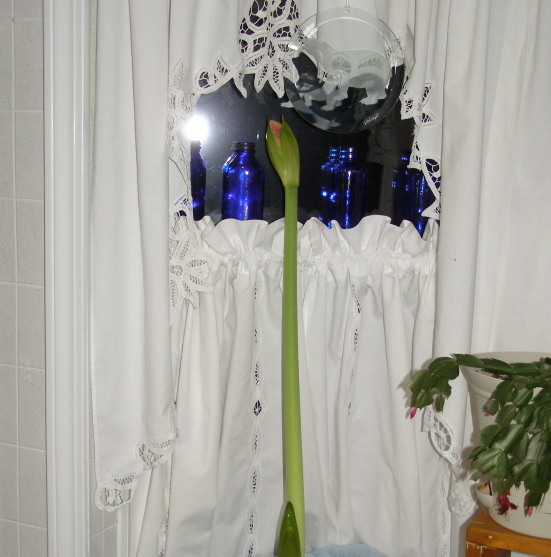 I'm not sure where I can move it to next...it is going to be too wide when the blossoms come out to stay on this windowsill. I'll worry about that another day! Spent part of the day cleaning stalls and buckets. A little knitting, a little hand quilting...life is good! 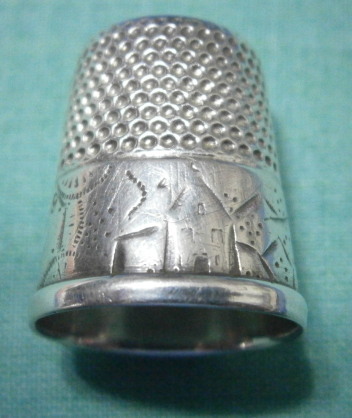 Thank you to Anonymous for the info on the thimble. I did not know that! 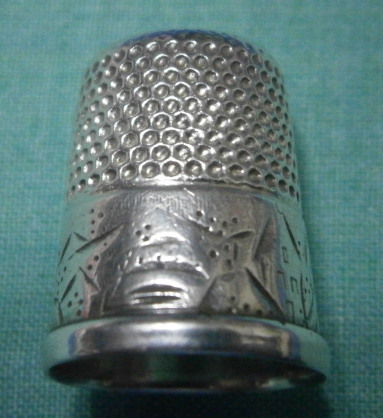 It's my favorite go-to thimble but I never leave home with it. That's it for tonight. Remember how truly special you are--I have so decreed it and I will have even more power to decree it once I am elected President! P.S. I am listening to Save Me by Lisa Scottoline. Quite a few years ago, my parents, my husband and I were at an antiques shop in the Finger Lakes Region. We spent quite a bit of time browsing and I happened upon a beautiful thimble. Now, Murphy's Law says that anything you love will not fit. But...Hoyle was on my side that day. This is the view from the top of the thimble. 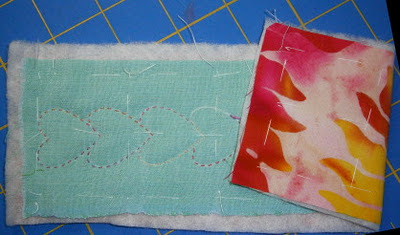 To show you that I am actually doing some work, here is a pic of my hand quilting sample. I wanted to test the backing, batting, top and thread on a sample before committing to the full piece. I am really happy. The top is Oakshott from England, the backing is a batik, the thread is Sulky Blendable in 12 wt, with vintage Thermore batting. I have over 1/4 of the actual piece quilted today. Early this afternoon, I looked up from my desk to see this visitor. About 15 feet from my window! 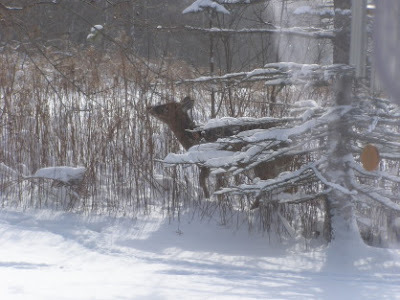 The deer here are so friendly that when I go in and out of the house or drive, I just wave and they resume their activities. If possible, I think it is even colder tonight than last night. But up to 41 degrees on Tuesday. Plus I saw a double sun dog today--huge! That's it for now. I've spent most of the day sewing, so I'll have something to show in the next couple days. A brass monkey's...well, you know. Temps hovering new 0 degrees, not counting wind chill. And snow. 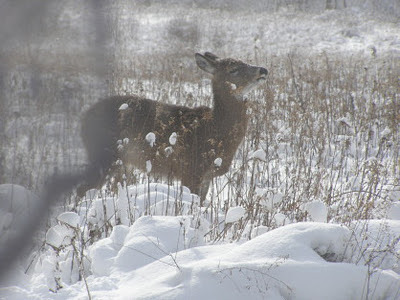 I had to actually use the snow blower today--my most fervent hope was not to have to use it this winter. But that's my hope every winter. This one has come the closest so far! Nothing very exciting today, but I just wanted to stop in and say hi. I know some of you have a three-day weekend, which is so exciting. 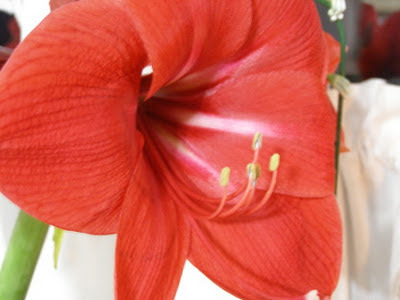 For those of you in the Monthly Bliss 1 class, remember we do not meet until January 23 and 30 because of the holiday. Stay warm--now is the perfect time to hand quilt something big enough to cuddle up in! 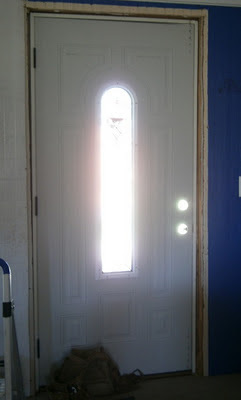 Part of the time last fall when I wasn't blogging I was actually doing some home repairs. Here is the original front door. 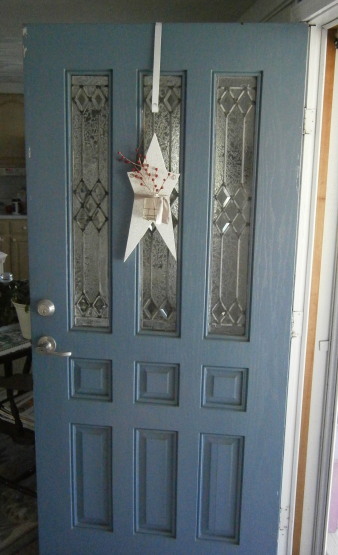 I have to say that I've loved that door for over 20 years--solid oak and stained glass. The unfortunate news? It leaked air like a sieve! And with the cost of fuel oil, that was not a good thing. 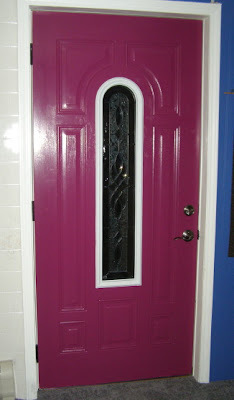 The new door! I must admit to being reluctant to venture into the door section of Lowe's, sure that I'd never be able to pick just one. But lo and behold, I looked at most of them, then looked up...and there it was. The whole process took less than 10 minutes! It is, of course, very white. Next came color! The pic is a bit brighter than the real color which is a dark cranberry. I just love it! 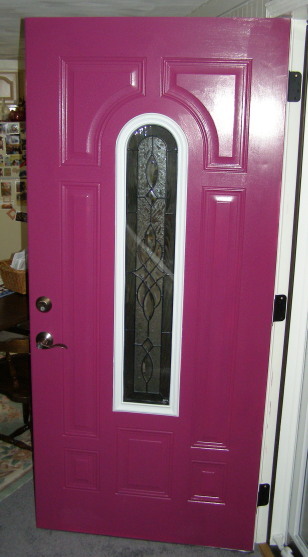 And the view of the outside of the door. It took three coats to cover the white. For a while it seemed like all I did was paint, repaint, and paint again. But the results were worth it. And the door is air-tight! A really good thing as we have gotten quite a bit of snow in the past few hours, along with major wind. I have spent most of the day finishing that binding. Now all my binding is done for a bit and I can move on to something else. P.S. I am listening to New York to Dallas by J.D. Robb. Remember the snowball tablerunners? Here are three more! Terry, on the left, and Shirley, on the right, both had their tops done. 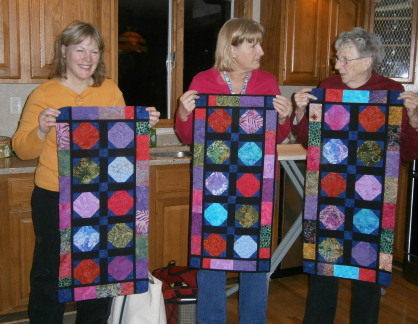 Debbie, in the middle, had hers machine quilted and bound! Everyone started with the same fabrics, but got to choose which 10 for the center, leaving the other 10 for the border. Shirley added/subtracted for her borders. This is a great runner. Debbie already has fabric to make two Valentine versions! We've also been working on the Duck Duck Goose quilt from one of the Kim Diehl books. Debbie chose not to do the piano key border, opting instead for two regular borders to frame the center. Debbie used reproduction prints. And trust me, every point is sharp! Great job, ladies! We will have more photos as finishes occur! That's it for tonight! Have a fabulous Friday! I know it's after the holidays, but this is a fabulous recipe for any time! Place bread in well-buttered 9 x 13" baking dish. Sprinkle with cheese. Combine the next six ingredients. Pour evenly over the bread and cheese. Sprinkle sausage and optional ingredients over the top. Cover and chill overnight. Preheat oven to 325 degrees. Bake uncovered for about one hour. 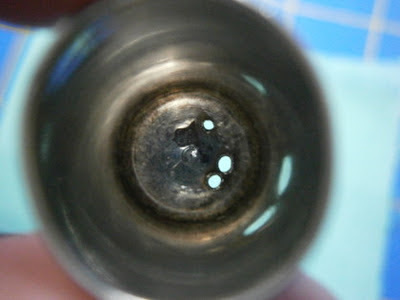 Tent with foil if top begins to brown too quickly. Serves 6. Sharon's Notes: I am especially fond of Italian bread (the freshly baked stuff). I have it sliced and then let it sit a day before use. I just tear it up--no cubing for me! I cut up an 8 oz. package of mushrooms and layer on top. I have not used the tomatoes. This is mmmmmm-mmmmmm-yummy! It's a favorite of my family and the leftovers are as good or better than the first meal. Start this Saturday night and have a wonderful Sunday brunch! Remember the ghost of amaryllis present? It is ghostly no longer! 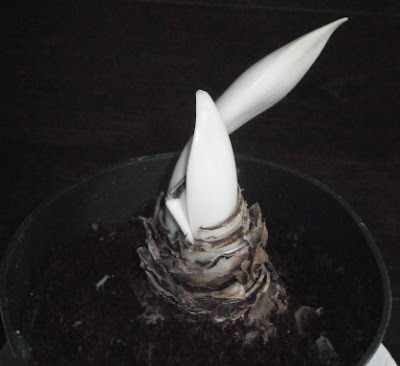 This is the same bulb tonight!! 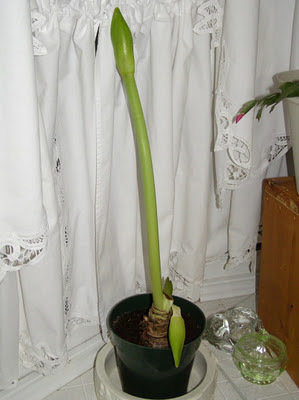 I do believe that the taller stem, in an effort to really put on a growth spurt, cut off the water supply to its sibling. I fear that it is taking a downturn. 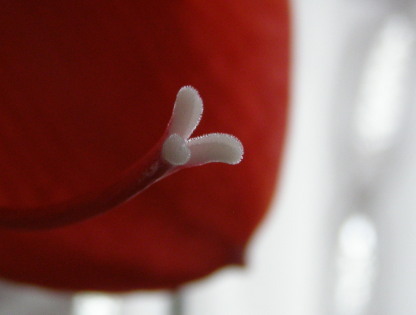 There are, however, two or three leaves making an appearance. I am still hand sewing binding. Another day and I am hopeful about finishing. It doesn't help that I work at it spastically. P.S. I am reading The Eighty Dollar Champion by Elizabeth Letts and listening to Chaos in Death by J.D. Robb. and I ain't got no pictures! Oh, well. It's been a day of quilting, sewing binding, reading, letting Lynnie in and out, keeping Callie off the quilts. In other words, pretty typical! I was watching the Republican Debate in New Hampshire tonight and thought I would remind you all that I am running for President AGAIN! I ran in 2004 and 2008--and garnered no votes. So I am going to start stepping up my presidential campaign so that I will stand a better chance this November. So stay tuned in upcoming posts for blatant campaign rhetoric. And, so that you will be prepared in November, remember to vote early and often. Change your clothes, change your hair, add or subtract glasses--but GET OUT THERE AND VOTE--but for ME! Okay, enough politics for one night--a little goes a really llllooooooooonnnnnnggggg way. P.S. I am listening to Why My Third Husband Will Be a Dog by Lisa Scottoline. Can we say WOW? Lori M. of Watkins Glen finished her Flower Garden top. Lori has a wonderful color sense--and she's not afraid to go bold. The actual fabrics are much brighter than they appear in the picture. Great job, Lori! I actually did a bit of hand quilting today--it's been a while, which makes me sad as it's my favorite part of the process. I have several things to get done over the next couple days--including hand sewing the binding on the frog quilt. But I am definitely back into quilt mode. Semper calcitat! P.S. Many thanks to everyone who has responded to the tech debate. If you have not yet commented, it's not too late. I know people are still "lurking" and would appreciate your input, as will I! I almost wrote Random Tuesday! I think I lost a day! At any rate, as I was looking through some old pictures today, I found two I thought would be interesting to share with you. 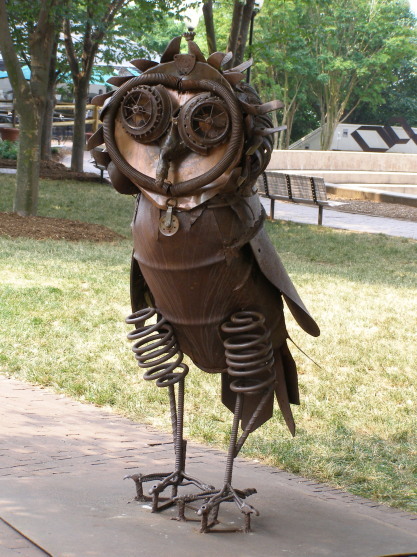 Both were taken in Winston-Salem, North Carolina. First--you all know the saying "When life gives you scraps, make a quilt". Well, I guess when life gives you scrap metal you make a sculpture! This piece is several feet tall! This church spire is just lovely. As you may have guessed, I am partial to taking pictures of what most would deem "odd" objects. 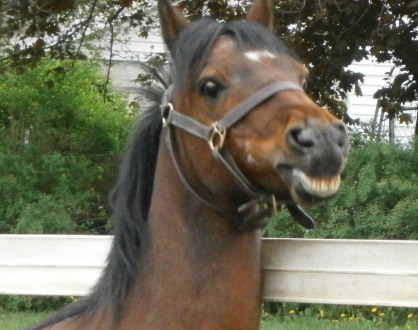 Some make me laugh out loud, some are just awe-inspiring and others are--well--just odd! First: Josie, please send along your address--I don't mind sending things "across the pond"! Second, my friend Jay said to tell Terri (and anyone else interested) that the Sewline threader replacement heads can be found at www.clotilde.com. Third: Thanks to all who have responded about the "technology" question. It's interesting to hear the pros and cons of these devices. I am reluctant to go the smart phone route--I still remember having most of my life organized on a PDA (that's a blast from the past!) --and then it crashed. I'm okay with separate things to do different tasks. Okay, enough randomness for this Wednesday! So, if Mittens, Josie, and Deb G. in VA will send their snail mail addresses to sharon@sharonstroud.com, I will get the prizes in the works. Karen, Emily, Janet and Cindy--I've got your numbers! Now I have a question. I have a laptop which I love. But, as you know, I have dial-up at home and lugging a laptop for a wi-fi connection is not a lot of fun. So, for those of you who have opinions, would/do you like a reader like Kindle Fire or Nook Color or a real tablet (not necessarily an iPad). I'm thinking of getting something a bit more portable so that I can actually view videos that are on-line, surf the web and maybe do a bit of reading. Any suggestions? I welcome all comments, good and bad, about anything related to e-readers and tablets--just be civil and use clean language, please. Also, do you like getting magazines on e-readers? Okay, that's it for tonight. Congratulations again to our winners!